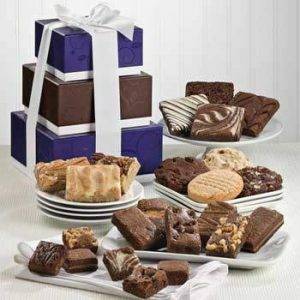 Send your favorite client, relative or friend the gift that keeps giving with our Brownies Gift Club! Each month, that special person will receive a gift that shouts "I'm Thinking of You" without your having to say a word! Send them to your friends, your family, and your customers and clients. What better way to make them remember you? You can choose from three different Clubs: 3 months, 6 months, or 12 months. The first month they will receive a classic tower (pictured on the right) along with a certificate announcing that there are more gifts coming in the other months. You choose the start date for the gift. After the first month, they will receive that particular month's designated gift which is a collection of assorted brownies. The gift includes shipping in the United States (except for AK/HI). This is a special offer that cannot be combined with other offers or discounts.